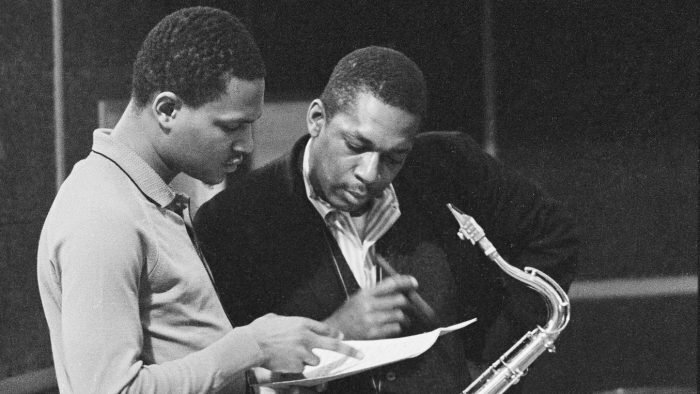 John Coltrane once had a conversation with saxophonist Wayne Shorter in which he likened the act of improvisation to the task of starting a sentence in the middle, moving backward and forward simultaneously. Impulse!’s 2018 title for the celebrated composer’s 1963 recorded “lost album” strikes as a posthumous ode to the continued relevance of this notion. Both Directions at Once remarkably captures a band in the heat of their critical and commercial prime, pushed and pulled by Coltrane’s restless creativity. 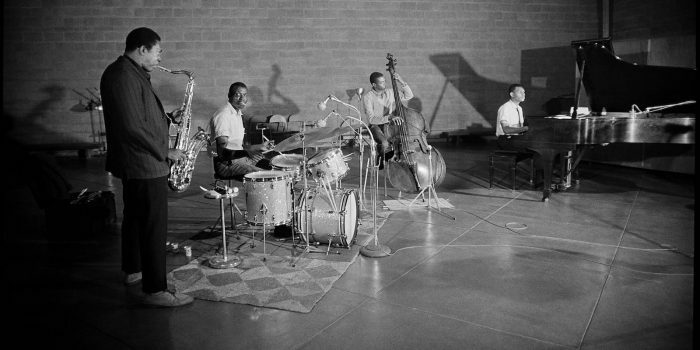 Entering The Van Gelder studio, in Englewood Cliffs, New Jersey, on March 6th, the “Classic Quartet” lineup of Coltrane, pianist McCoy Tyner, bass player Jimmy Garrison, and drummer Elvin Jones set about recording an hour and thirty minutes of largely fresh material. Whilst the artistic intentions for this work remain something of a mystery, the session is indicative of the freedom the band-leader enjoyed as a result of his close relationship with producer and label head Bob Thiele; as the latter recalled, “My contribution with Trane was to let him record whenever he wanted, even when the corporate power structure was opposed to it”. A firm favourite of Coltrane’s, this studio was the place in which the vast majority of the group’s celebrated work was recorded. It’s acoustically focused design, boasting a 39-foot-high, cathedral-esque, vaulted wooden ceiling, was forged by an Oregon-based company which helped create blimp hangers during the second world war. As a result, it’s likely Coltrane had this inspiring creative space – and its unique tonal qualities – in mind when writing many of his finest works. Despite the commercial pressures placed on the artist following the surprising success of his 1961 interpretation of “My Favourite Things” (which exposed the saxophonist to a new audience outside of the immediate jazz circle), Coltrane maintained a delicate balance between mainstream appeal and avant exploration. In the days surrounding the Both Directions at Once session he would record with both Duke Ellington and Johnny Hartman, two artists operating in a far more conventional manner than Coltrane would typically consider for his own work. His contractual obligation of two albums a year for Impulse!, and the understanding that he would try to expand his new-found audience, only served to heighten the challenge of constant artistic movement. 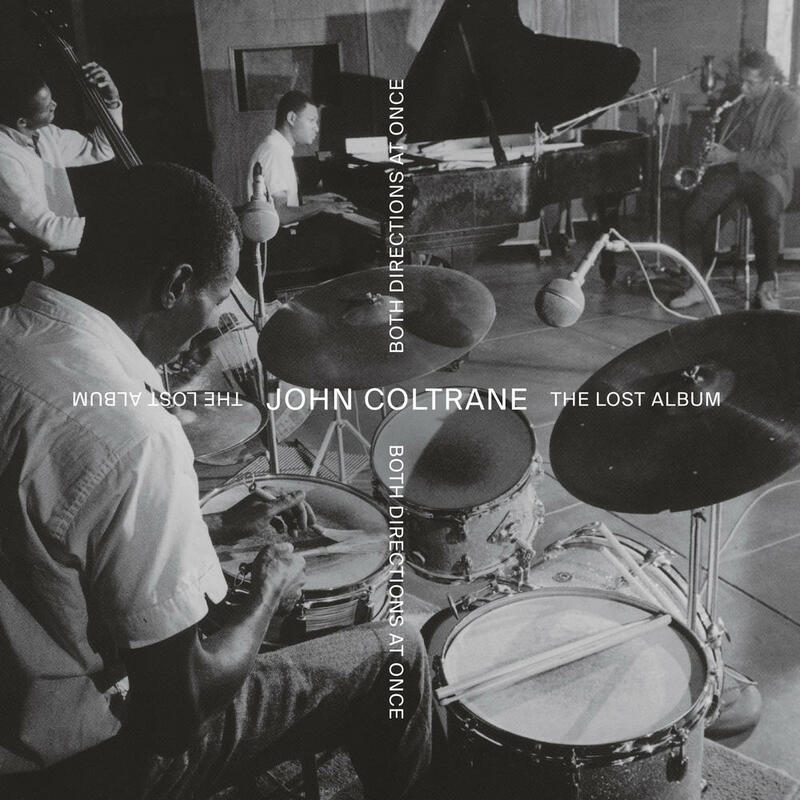 From the very beginning of the album, Coltrane plays with our perception of form, pushing “Untitled Original 11383 – Take 1” beyond it’s seemingly rudimentary 12 bar blues by introducing jarring transitions and Tyner’s multi-directional chord changes – deconstructing the foundational ideas established by musicians of the Mississippi Delta decades before them. Aspects of this work can be seen to have informed qualities of his later output, most notably the classic A Love Supreme, which would emerge just eighteen months later. In contrast, this is followed by ‘Nature Boy’, an early take of a composition which would reappear fully-formed in 1965. Coltrane’s ear for repetitive, ear-worming melodic lines is in fine form, as he deconstructs and builds upon singular motifs with fascinating flourishes and breakneck melodic sprints. Similarly on ‘Vilia – Take 3’, taken from the 1905 operetta The Merry Widow, Coltrane shows a sense of restraint and respect for the source material, underlining his willingness to play a popular tune in a relatively straight style – still treading that tight-rope between two worlds. The band’s instrumental talent is also given room to showcase their diverse strengths. In particular, Elvin Jones displays his incredibly adaptive style of drumming, creating space and dynamic pressure in equal measure to allow each soloist to truly explore a multitude of musical directions. His contributions were often a propulsive force in Coltrane’s more experimental work, consistently pushing the bandleader into new territories, and here on tracks such as ‘One Up, One Down – Take 1’ the hugely influential percussionist is given plenty of moments to shine. Perhaps that’s why this lost album is so fascinating – it captures the quartet at the peak of their synchronicity simply creating in a way that feels free of any extraneous conceptual baggage. This seemingly low-key session provides a brief, unseen snapshot of an era in which jazz was moving beyond the limitations of post-war bebop and into uncharted, and often unpopular, territory. Coltrane was just one of so many innovators who shook and challenged the foundational ideas of this genre so intrinsically tied to African-American artistry and identity. But what Both Directions at Once confirms is that even in death Coltrane’s work continues to illuminate new paths – from memories of the past to horizons of the future.